Yes, it's time to become someone else...someone you've identified as a hero, according to our classroom definition that we all agreed upon. We have Library time to research and you have been taught how to do your research using the handouts we provided. Now, it's up to you. - write an introduction and conclusion to complete the 5 paragraphs. It is due Friday, June 6. - turn your paragraphs into cue cards to practice your presentation. They are due Monday, June 16. 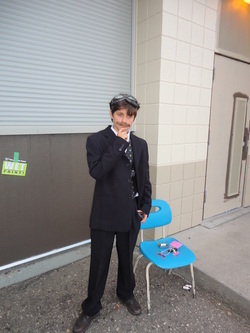 - find a costume and, if you like, 1 prop [don't spend a lot of money...go to Value Village, for example, or talk to us at school] Cue cards, props and costume are due Monday, June 16. - set up and present in the school field soon after we return from Gardom Lake. ﻿Present:﻿ Friday, June 20! It's the same day the PAC are offering the hot dogs! It's a blast! Parents, please plan to invite extended family members, family friends, even neighbours!